Data-Driven Information Consumption: Heralding a New “Golden Age” of Journalism and Content Creation? Things are changing dramatically within the publishing industry. However, news media itself isn't on the wane, as many pundits are stating. 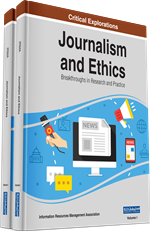 In this chapter, the author explores how the business model for media organizations is shifting away from print, and away from the “gateway” approach to journalism and content development, in which a few select articles are presented to audience by editors, writers and reporters. In its place, the new digital media model is creating a plethora of content from many different sources, oftentimes first-hand accounts, original sources, or commentary. In the process, rather than resulting in a dearth of news content, audiences have access to an often dizzying, overwhelming and potentially contradictory content. This is creating potentially new roles for news and publishing organizations, serving as sources of validation and aggregation of content. At the same time, the rise of digital media is providing consumers a far wider range of choices pushing media organizations to provide content more tailored to their audiences. Are we in the midst of a decline in the editorial and journalism profession, or are we actually entering a new golden era? Many observers have been arguing that we have and continue to experience the former; that is, the pillars of the profession are being swept away by the internet tide, that the business model that supported the hiring and paying of editors and journalists is being disrupted. In its place is a wide online assortment of services and community-based social sites, with an easily clickable, vast array of information –often first-hand accounts on social media or original sources posted on the web -- on a moment’s notice. Beneath all the doom and gloom however, there is a new movement afoot. That is, the editorial and journalism profession is arising in a new form, built on electronic capabilities, more responsive to readers, and driven by data on what audiences seek and prefer within their content. Behind this is the need for informed reporters capable of looking behind the misinformation and hysteria potentially created by the internet, capable of validating information being provided and shared on a particular issue or event. Events such as the disappearance of Malaysian Airlines Flight 310 in March 2014, or the downing of Flight 210 over Ukraine in July 2014, resulted in wild, unsubstantiated rumors over the internet (Pepitone, 2014). As NBC News reported shortly after the disappearance of Malaysia Flight 310, Chinese social media (most of the passengers were Chinese citizens) was rife with rumors that the aircraft had been spotted making an emergency landing somewhere in China (Pepitone, 2014). As the Ebola virus ravaged parts of Africa and a traveler from an affected country was diagnosed and died of the disease in Texas, social media networks lit up with rumors and exaggerated accounts of the spread of the disease to North American shores (Luckerson, 2014). The ultimate trusted authority on such events, in turns out, were editors and journalists reviewing and reporting the facts as they were known, through well-known news channels. While there is a wide and almost unlimited variety of sources of information now available through internet-based channels, few have the credibility that signals that due diligence was taken to ensure that the information was the most up-to-date and credible reporting available. Is the “old” news delivery model – built on a few, established gatekeepers and editors checking and double-checking on reported information – threatened with extinction? Is this model being replaced by a more free-for-all mode of multiple delivery channels, in which audiences are expected to survey and assemble to draw their own conclusions? Looking at the numerous obituaries that have been surfacing on the state of today’s news organizations, one can be forgiven for thinking so. But from the ashes of the collapsed old news delivery model, a new phenomenon may be rising. There is evidence that contrary to the common accepted belief that the news business is on the wane, the editorial and journalism profession may actually be entering a new golden age, built on instantaneous engagement with social networks around the global, supported by data-driven capabilities. Most importantly, information needs to be built on a foundation of trust and engagement with the audience, which points to a new emerging role for news organizations.